Milan came out confidently, with De Sciglio taking a shot that was just wide in the 5th, and El Shaarawy, one of our best defenders, making a nice clearance at the other end just a minute later. There was some extra entertainment as Yepes and Bonucci were arguing in the 12th minute, nice to see Yepes defending his team verbally, too. But in the 14th minute, I was very surprised to see Boateng, who has been literally missing in action lately, win the ball, dribble it down, and even get a shot on goal, even if Buffon saved it. That’s when I knew this game would be magical. 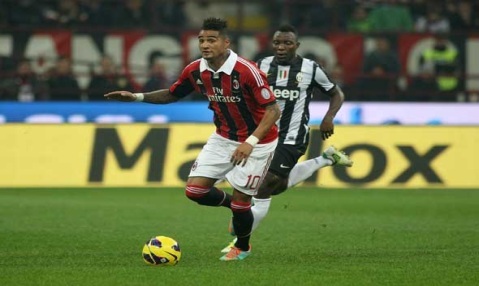 If Boateng is playing well, the team will, too, I guess. Nocerino, a Juventus youth product and former first team player, also turned in a great performance against his former club, even if he earned a yellow for being monstrous with Caceres in the 17th. Almost everyone had their best game tonight, certainly Amelia did. He was calm and cool in goal and managed everything from the easy saves to the supersave. Like Quagliarella’s shot in the 24th. No problem. A beastly save in the 61st? No sweat. Abbiati had some back pain in warmups, so the man who wears number one got the start. Okay, not such a great day for celebrations, but who cares? Montolivo showed some of the class that earned him the unusual distinction of wearing the captain’s armband in the 24th when Pirlo gave Robinho a nasty kick in the ankle, Montolivo was calm and collected when talking to Rizzoli about it. Funny how Bonucci didn’t take it so well just 3 minutes later when Robinho made contact with him. I guess that shows the difference in character. Rizzoli must have read what all of the Juventini were saying about him ahead of this match, because in the 30th, he showed Isla yellow for handling the ball in the box, and gave Milan the penalty. Many say the ball did not actually touch his arm, but rather his ribcage. I say Muntari, Shmuntari. Sometimes you get the call right, sometimes you don’t. It all evens out. No big deal that this penalty decided this match, right? Isn’t that what we were told last year? But this time, Robinho stepped up, Buffon guessed correctly, but couldn’t hold onto it, goal. Milan 1-0. The more physical side of this match reared its ugly head, which worked a lot in Milan’s favor. Like in the 38th, when Barzagli fouled El Shaarawy earning Milan a free kick. Or in the 43rd, when Bonucci’s handiwork earned him a yellow card and another Milan free kick, which Montolivo sent straight into Buffon’s arms. Milan had a total of 15 shots with 6 on goal, whereas Juventus had only 13 shots, with only 2 on goal. I suppose it helps that our defensive line was the best we’ve seen all season. Speaking of Buffon, following the half, El Shaarawy gave him a scare in the 49th, that kid is just so fast. I don’t think I’ve seen Buffon panic like that in a very long time. In the 52nd, Pirlo took a free kick back to back with a corner kick that gave us all a heart attack. Alessio sending on Giovinco for Quagliarella in the 57th was a good move for him, the diminuitive striker immediately created more chances for Juventus. Padoin was a nother Juve sub that threatened to change the game, but didn’t affect the outcome. Amelia had a fantastic save in the 61st minnute followed by Giovinco attempting a Mexes shot in front of goal in the 63rd. Povero Giovinco. A minute later, Yepes, who was absolutely boss on the night, was given a warning for a foul that probably should have been a yellow. Maybe the ref knew he would miss the next match if he did, so he spared him. This was followed by Pazzini coming on for Robinho in the 65th. And in the 68th, a shot from Nocerino that nearly skimmed over the crossbar, perhaps his best shot so far. Mexes went out in the 72nd, apparently due to a re-injury to his ankle, with Zapata coming on in his place. In the 83rd, Yepes had a nice header stopped by Buffon, and at the other end, Constant stopped Vucinic like a boss. Constant would have to be my MOTM, he just seems more brilliant every time he plays at left back. He’s our only left back that truly understands what is needed on defense, and also has such beautiful crosses at the other end, too. That was not the Boateng we all loathe tonight... it was the good one! Allegri threw on Flamini for Boateng in the 84th. I think this was perhaps Boateng’s best game of the season, too, as zero balls were launched into space and he had some good tackles and possessions and yes, shots on goal. However, at this point, Juventus played quite desperately, fouling all of our best players. Like Marchisio, who earned a yellow in the 86th for fouling De Sciglio. Or in the 88th, when Constant was injured. I hope he’s fine, he went down hard. And it wouldn’t be “the true Derby d’Italia” if it wasn’t closed out by Yepes and Giovinco mixing it up. Giovinco shoved Yepes in the stomach (it would have been the chest, if he could reach it,) and so the ref showed both of them yellow cards. So Yepes will miss the next match after all. I would like to know what Berlusconi said to these guys at Milanello yesterday. It must have been a Bunga Bunga invitation that brought them out of their slump and gave us great performances from all of the players. That is what we need. We are no Barcelona, our team is still Budget Milan™. But when we have a decent lineup, some consistency in who plays, and all of our players work together and each play their best, we can have a decent game. With only 39% possession, we maximized the one chance we were given, and kept Juventus on their heels for 90 minutes. Of course, it helps when your opponent doesn’t play to their potential, too. So for now, savor this win. More emotionally charged than the three points would show, and a victory for the psychological side of the team, too. We will have to replicate this level of play week in and week out to have any mathematical chance at Europe. Given our start this season, that is unlikely. But not impossible. So as long as there is a chance, let’s use this victory to dream… and dream big. Tonight we’ll all sleep a little better… Vindication.